Gucci Guilty is suitable for woman who wants to highlight the unique charm. Gucci Guilty 75ml. Eau De Toilette is about breaking social conventions and the feeling that you can attain whatever you want. It is about pushing your personal boundaries and experiencing the thrill of the forbidden, so you feel free and invincible. Without any compromise, Gucci Guilty is a statement about who you are. 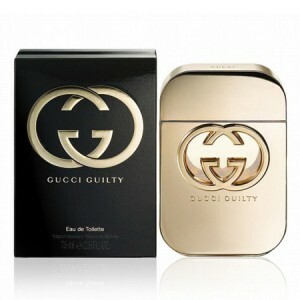 Gucci Guilty is a warm yet striking oriental floral with hedonism at its heart. Top notes include mandarin and pink pepper. The middle notes comprise of heady lilac, geranium and peach. The fragrance finishes with a base of patchouli and amber. Gucci Guilty speaks to the bold, trendy, but always authentic, Gucci character. It awakens the senses with a daring edge of sexiness and sensuality that is Gucci. Gucci Guilty perfume for women is a floral oriental notes, especially suitable for chilly days of fall. The base is made of warm colors fragrance of patchouli and amber that give a touch of sensuality. These flavors combine perfectly with fascinating notes of lilac, geranium and peach. Due to its ingredients, Gucci Guilty perfume may seem as suitable for parties or important social events, but we recommend using this scent for any time of day. A fragrance suitable for any woman who wants to highlight the unique charm, so Guilty may be an appropriate gift for a loved one in your life.